Nothing starts off your day on the wrong foot like not being able to find your favorite eyeliner or other makeup in the morning. You knew you left it in that drawer in your dorm desk ... and now, it's gone! So you rummage through your purse and coat pockets. Nothing. And now you're late for class! 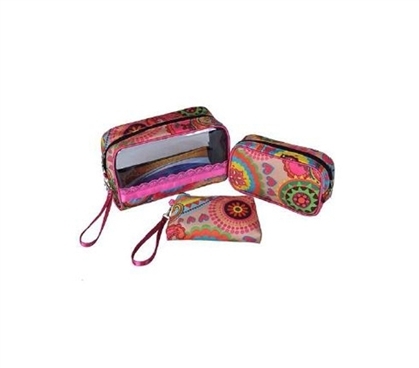 Avoid this scenario altogether by adding this 3 Piece Cosmetic Bag Set - Yellow/Pink Floral to your supplies for college. With three separate, smaller makeup bags for college, you can keep all your essential makeup separated in the three different bags. Instead of one big makeup bag for college or trying to shove everything in a desk drawer, stay organized with these college cosmetic bags. These smaller bags for makeup are also perfect for taking with you to class. If you need to touch up your makeup in the middle of class, toss one of these cosmetic cases for college in your purse and take your makeup on the go. Many girls will toss their eyeliner, lip gloss, or other makeup right into the main pocket of their purse. Those are the girls who have to spend 20 minutes fishing their makeup out! Keep your makeup and other dorm stuff more organized with these cheap cosmetic bags. You'll save time while making college life that much more convenient.